Since we built our first pumps in 1938, the Carver name has become synonymous with value. Since we built our first pumps in 1938, Carver Pump has become recognized as one of the leading centrifugal pump companies, building pumps to the most demanding engineering specifications and military standards in the world. We were one of the first American pump companies to attain ISO 9001 certification – the most recognized standard for quality in the world. This certification is your assurance that our commitment to quality includes not only our hardware, but also superior customer service, leading-edge R&D, and continuous improvement in everything we do. So whether the job is refueling fighter jets on the deck of an aircraft carrier, supplying paint to an auto assembly line, or bringing water to the fountain in a city park, we put our reputation on the line everyday with every pump we build. Whether you’re working with one of our distributors or directly with a team member, we take the time to fully understand your goals, ensuring that our product exactly fits your needs. It’s not about selling equipment – it’s about solving or eliminating problems before they develop. For decades, our products have been successfully living up to the intense demands of the US Navy. This increased level of scrutiny has driven us to achieve exceptional durability and the highest level of precision. Our company is headquartered in Muscatine, Iowa, where our pumps are engineered and manufactured. Our third-generation family ownership and commitment to American manufacturing give our customers, partners and employees confidence. We’re proud of the fact that we didn’t buy our market share – we earned it. Carver Pump was founded by Roy Carver Sr. in 1938. The original factory was located next to the Mississippi river in Muscatine, Iowa which is about 25 miles southwest of the Quad Cities area. Engineered to your specifications with unrivaled service and support. Whether you need to fix a problem with an existing pump or find a pump for a new application, our team of engineers and technicians is here to help. 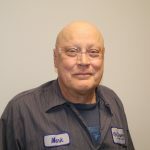 Mark has worked for Carver Pump for over 30 years as both a test lab technician and now as our test lab manager. Mark is in charge of making sure that every pump meets it intended performance before it leaves Carver Pump.